The Red-Brown alliance develops, George Galloway is to back Nigel Farage’s Brexit Party for the Euro-elections. Brexit is the opposite of Nazism. It is a cry for national independence, which the Nazis loathed. It is a campaign for democracy, which the Nazis destroyed. Nazism was hateful and anti-human — Brexit is positive and democratic. This is a tactical judgement. I’m serious about #Brexit I’m even more serious about democracy. The Conservatives and the Blairite 5th Column have rendered both parties redundant in the European Parliament elections, as my critics will shortly see. We confidently predict that this red-brown alliance will receive more support. It appears he is not on his own. Chelley Ryan is a Corbyn cultist and a prolific tweeter and Facebook poster who has also posted for Red Labour and writes for the Morning Star. She has tweeted in support of the Brexit Party. There have been others on social media. Is this just Stalinist fraying at the edges or is there more to it? Sadly because the left failed to set up a lexit party, they left the platform to Farages new party and UKIP. If someone prominent on the left now stands on a platform with Farage and puts a Lexit case is this really so bad. Do we really want ppl only to hear one narrative!? UPDATE: from far-right Daily Express. THE Labour EU elections list is so remain heavy left-wing Brexiteers are throwing their lot in with Nigel Farage, including George Galloway. Fellow left-wing Brexiteers also promised to vote for their former political enemy Nigel Farage. Simon Middleton said: “I totally agree with you Mr Galloway. Next month’s elections are about Brexit, pure and simple. This is the only Realpolitik decision that could possibly be made after all the insults & betrayals-the Euro Election will be OUR referendum on Brexit-a 2nd vote Remain camp has been demanding, marching about & gathering dodgy petition signatures for from all around the world. Perhaps this tiff is forgiven now….”In an article in The Australian newspaper, 15th January 2009, ‘Critics of Israel giving voice to anti-Semitism’, I stated that George Galloway, British MP for the Respect party, had called for a boycott of ‘Israel’s shops’ and that this meant that he was calling in practice for a boycott of Jewish shops. This was incorrect and I now understand that he was calling for a boycott of ‘Israel’ shops which is a mobile retailer operating in shopping malls and who sell Israeli goods and was not referring to ‘Israel’s shops’. I apologise to Mr Galloway for the mistake, and I withdraw the suggestion made in my article that he was showing or encouraging anti-Semitism in calling for this boycott. Frank Furedi, 9 February 2009″. Labour Will not Win by Competing for the Brexit Vote. The Tories are in steep decline, and the Brexit Party (Farage, Annunziata Rees-Mogg, Spiked – Revolutionary Communist Party oddball, Dr Alka Sehgal Cuthbert to name but their best known candidates), are slugging it out over ownership of the fear of god with UKIP. Labour is a strong position to stand up for internationalism. The anti-cosmopolitan Full Brexit crowd is still trying to drag the party into a competition with the three Brexit parties and adopt National Populist policies. Labour’s leadership, following the party’s conference policy, tabled the option of a new referendum in Parliament – and it was decisively defeated, as it was when tabled separately. But to those aware of working-class opinion, especially outside London, it’s always been clear that Labour had to see through Brexit or risk alienating huge tracts of its heartlands. Labour’s current strong polling shows that the majority of its base understood that Jeremy Corbyn has played a difficult hand brilliantly. But if Labour wants to win power – as millions of suffering people in this country desperately need – it’s now time for the party to focus on delivering a Brexit that works as well as possible for everyone. Ultimately, that’s always been true. Those who can’t see beyond a desire to ‘stop Brexit’ to the greater prize of a country governed by Labour for the many cannot be allowed to dictate the party’s agenda, tactics or message. Excellent work @annPettifor & others! Calls for Jeremy Corbyn to back remain at the European elections have intensified as a strongly pro-EU manifesto penned by left-wingers was passed to the Labour leader. Titled “Remain, Reform, Rebel”, the document was penned by Corbyn allies, including his ex-economic advisor Ann Pettifor, and has been endorsed by every sitting Labour MEP set to contest their seat should the Brexit deadlock trigger the May 23 poll. It demands an EU-wide Green New Deal – similar to that advocated in the US by Democrat politician Alexandria Ocasio-Cortez – to include a “European super-grid” and pledges to make the continent 100% served by renewables by 2050. Labour’s official manifesto will be be decided separately by the party’s ruling National Executive Committee and the party has said it will consult with a range of stakeholders. Talks between Corbyn and Theresa May were set to enter a third week on Monday as the pair attempt to thrash out a compromise after the prime minister’s withdrawal agreement was rejected three times. While elections to the European Parliament are not yet certain, all parties have begun preparations to take part. It comes as party insiders increasingly fear the European Parliament elections, which will be held almost three years after the 2016 vote, will inevitably morph into a proxy referendum on EU membership. A Labour source told HuffPost UK MEPs see the Remain vote will split between the new Change UK party, the Lib Dems and Greens, handing Nigel Farage’s Brexit Party a path to victory. Turning to the Commission’s draft manifesto, they said: “These talks are like a death dance with the first who stops accused of collapsing. “This is the left’s bid to show that we aren’t afraid of fighting on an overtly pro-European election. “We want to come out fighting and to be able to say we are part of a pro-European alliance that wants to push things in the direction of a socialist Europe. “We are saying to Labour as a commission: bite the bullet, get behind where the membership are and the majority of Labour voters are. 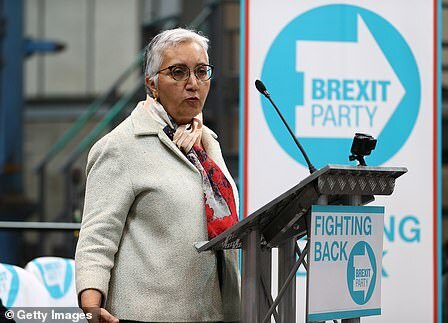 Former Revolutionary Communist Party’s Spiked: Alka Sehgal Cuthbert Candidate for Farage’s Brexit Party. Prominent Spiked Contributor Dr Alka Sehgal Cuthbert stands for Farage’s Party. Alka Sehgal Cuthbert, another of the party’s new candidates, is a former member of the Revolutionary Communist Party. “My son still finds it very difficult to countenance this,” she told The Daily Beast. Head of Education and Culture @Policy_Exchange. Associate editor @spikedonline. Articles by ALKA SEHGAL CUTHBERT on Spiked. Defending Eddie Dempsey she re-tweeted this. As Farage and Far-Right Moblise for Hard Brexit ‘Left Wing’ Full Brexiters Go for Collaboration with “Brexit Right”. Farage has “done more for Brexit than any socialist since Tony Benn” Tim Pendry, Crisis, Reputation & Political Adviser/Corporate Communications Adviser. “Independent support for a simple idea – Brexit first, socialism second … all else is suspended until the vote of June 2016 is respected” (Pendry’s Twitter Account). Supporters were due to meet near the Shard on Friday afternoon, at the same time several other demonstrations were due to take place on the other side of the Thames. 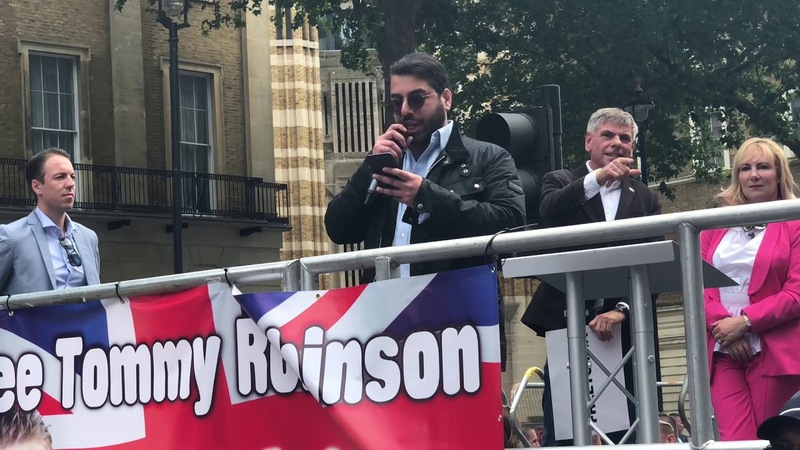 Tommy Robinson was to speak at Ukip’s Make Brexit Happen rally in Whitehall, which he is also financially sponsoring through his personal “news service”. Mr Robinson claimed people were being “betrayed” by the prime minister and “traitorous” MPs. But there are already signs that some of the ‘left wing’ pro-Brexit crew intend to ignore this assertion. They also lay claim to back a “genuine Brexit protest”. The debate became impassioned from the floor (although always civilised). The bulk of the feeling in the room, as I interpreted it, was for collaboration with the Brexit Right against the system. 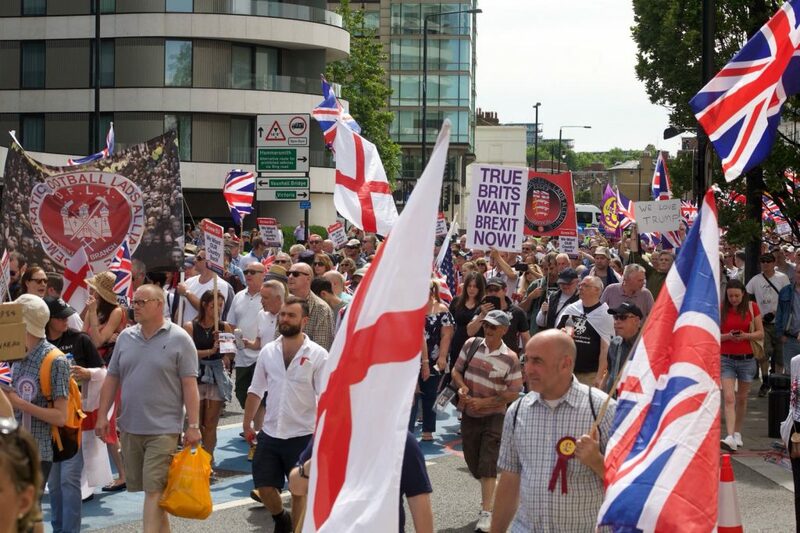 The immediate question was whether to turn up at Parliament Square on March 29th for a demonstration organised by the ‘Faragists’ and where Tommy Robinson might also be present. The official line was to do what one liked as individuals but to have no banners. It would, in this traditional left-wing view, be guilt by association with fascists in trying to persuade the rest of the Left to shift sides from Remain to Brexit with fears of a right-wing or Tory Brexit. The analysis began to break down under scrutiny. For a start, half the audience refused to accept that Farage was a ‘fascist’ – he was just a typical country Tory who had done more for Brexit than any socialist since Tony Benn and his democratic credentials were there for all to see. Pigeon-holing him (as opposed to Tommy Robinson) as Far Right was just not going to work. The oddest unintended consequence of this farrago may be that British national populism engages in the new Europe that is emerging while liberals look on with mounting horror and wonder precisely what their resistance was all for. The logic is Labour being steadily degraded by the rise of a working and lower middle class national populism for reasons of culture and distrust as much as anything else. In short, thwarting Brexit paradoxically enhances the revolutionary potential of Brexit … its absence rather than presence creates the ‘revolution’ (more cultural than anything else) whereas an elite Brexit would have dampened down the growing and widespread sense of outrage at the loss of respect for voting rights and ‘agency’ (as Brexiters now see it). Perhaps inspired by Red-Brown Eddie Dempsey ‘s rousing words against liberal elites he has tweeted. Our next speaker for Friday's Parliament Square rally is… @PaulEmbery. In a parallel development, FBU official and prominent supporter of The ‘left-wing’ Full Brexit, Paul Embery denounces “cosmopolitans” and praises the “magnificent protests” of the Gilets Jaunes. Despite the TUC having a history of pledging solidarity to internationalist causes and movements, it has uttered not a word and lifted not a finger in support of the gilets jaunes in France. These magnificent protests – an explosion of genuine working-class anger, a guttural roar against an arrogant, detached establishment, enjoying massive support from workers across urban and rural France (and beyond) – have generated not a syllable of support from the representatives of British workers just a few miles across the Channel. "Enculé, tu travailles pour les juifs!" Gilets Jaunes to Journalist: Bum-Boy You’re working for the Jews! Through Brexit, an accidental alliance has emerged between two groups alienated by the modern liberal establishment and holding fast to old-fashioned communitarian, small ‘c’ conservative values: on the one hand the working-class post-industrial towns, and on the other middle-class suburbia. It’s what the commentator David Goodhart has perceptively identified as the ‘Gavin and Stacey’ coalition, an “illustration of a benign independent-mindedness and pride in place that infuses two Brexit heartlands: Essex and ex-industrial South Wales”. As a passing note, Larry O’Nutter, under his pseudonym, Larry O’Hara is another Brexiter, and a supporter of the Full Brexit. We await his ‘anti-fascist’ analysis of this confusionist brown-red alliance. 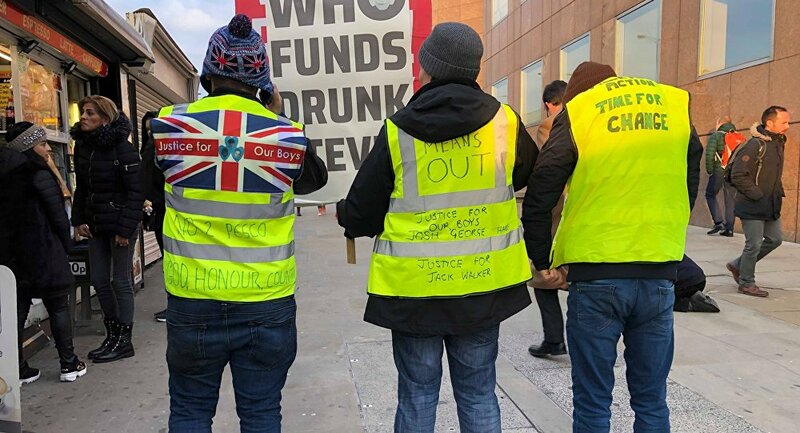 Leave Means Leave Campaign Gears Up Hate Campaign with Bile Against Jo Cox as Farage Prepares for Second Referendum. .
British Giles Jaunes for Brexit. WATCH | Brexiteers in yellow vests bring Westminster Bridge to a standstill in protest at Theresa May's Brexit sell-out. Nigel Farage tells Leave Means Leave rally to prepare for second referendum on Brexit. Nigel Farage has said he believes the UK may face a second Brexit referendum in the coming months and has urged Leave campaigners to “get ready for every situation”. The MEP and former Ukip leader said he did not think “the great Brexit betrayal is anywhere near finished” and was “more fearful than any point in this process”. Speaking (in American), at the Leave Means Leave rally in London on Friday night, Mr Farage said: “My message folks tonight is, as much as I don’t want a second referendum, it would be wrong of us on a Leave Means Leave platform not to get ready, not to be prepared for a worst case scenario.”..
Mr Farage was joined at the event by other prominent Brexit campaigners including Conservative MP Jacob Rees-Mogg, Tim Martin, the owner of JD Wetherspoon, the Democratic Unionist Party’s Sammy Wilson, and Labour MPs Kate Hoey and Graham Stringer. Provider of the “essential theory” behind the UK’s 2010 austerity programme. Lead economist of the official Leave campaign. Main proponent of CANZUK Tweeted a couple of days ago. It's impossible to avoid the thought that that 4-6% margin that the murder of Jo Cox cost the Leave vote in 2016 has had a profound impact on politics. (Leave was 10% ahead & rising, before her horrific murder.) One of the most influential assassinations in British history. More: Is this the most disgraceful comment ever associated with Brexit? Given the hard right bloc now in view, with its ‘Gilets Jaunes’ and other far-right outriders, the internationalist left campaign for Another Europe comes to the fore. Another Europe has a plan – to fight for and win a referendum on Brexit, and to transform Europe. We also have a strategy for every outcome in the coming period, win or lose, referendum or not. Our campaign against Brexit is indelibly linked with a campaign against the status quo: for a society run in the interests of people and the planet, and for free movement for all. There could soon be a general election – and we all need to get organised wherever we are to make sure there is a majority in parliament for a referendum. Farage Begins Hard Brexit Campaign with ‘Leave Means Leave’: The Real Fight over the European Union has Begun. Will This Bunch of Charmers Join Leave Means Leave’s ‘Battle for Britain’? Leave Means Leave campaigners Richard Tice and John Longworth have spoken out in the strongest terms of the betrayal looming over Brexit talks. They said: “Public anger is palpable. Among those most keen to support a new campaign are traditional Tory donors disillusioned by the handling of Brexit. “A number are so angry about what is going on that they have told us they will stop donating to the Conservative Party unless there is a major change in approach. Mr Tice and Mr Longworth said they set up Leave Means Leave as a six-month project in the belief the Government could be trusted to do the job they had been instructed to do by the British people. They told the Daily Telegraph: “People knew what they were voting for. They dismissed the ridiculous scaremongering of Project Fear and voted in the largest numbers ever to leave the EU. “None of us imagined that, two years on, we would have to refight the battle. We never dreamt that we would have to attack some desperate ‘Chequers’ proposal from the Prime Minister, which led to the resignation of two of the most influential Brexit-supporting Cabinet ministers. Writing in The Telegraph, Nigel makes clear that he “will go back on the road to campaign once again” for the pro-Brexit group Leave Means Leave. We stand with Nigel for a clean Brexit. Westmonster will always fight for Britain’s independence, but we need your help. If you support what we do, please donate so that we can go on countering the mainstream media’s Project Fear. Thank you! Nigel Farage has announced he will once again begin actively campaigning in British politics against Theresa May’s “fraudulent” plans for Brexit. The ex-Ukip leader said it was necessary as a result of the “deceit and treachery” of politicians and senior figures in British society in their approach to EU withdrawal. In particular he singled out an exclusive report in The Independent on warnings from the British Medical Association that a no-deal Brexit would be a “catastrophe” for the NHS. It comes as The Independent also drives forward with its Final Say campaign for a new referendum on the outcome of Brexit – with more than 650,000 people now having signed its petition. Pressure is intensifying on the government ahead of Brexit day in March next year, with Theresa May’s own MPs even drawing up alternative proposals to the prime minister’s, and meagre public support for her approach. He said: “It is now beyond doubt that the political class in Westminster and many of their media allies do not accept the EU referendum result. “It is equally clear to me that, unless challenged, these anti-democrats will succeed in frustrating the result. He said he had decided to commit himself to the Leave Means Leave campaign, which is set for a relaunch, following discussions with its founders, businessmen Richard Tice and John Longworth. In his piece, Mr Farage wrote: “To make matters worse we are subject to a daily stream of negative to beat us into submission. “The latest example was the British Medical Association suggesting that a no-deal Brexit would lead to huge numbers of people dying. Mr Farage was referring to an article in The Independent in which the BMA said a failure to secure a deal could increase the risk of a Europe-wide pandemic. The doctors union warned in a new briefing paper that the UK’s ability to coordinate responses to emerging threats, such as the current outbreak of measles or seasonal flu, will be seriously undermined, making it harder to stop infections spreading across borders. The British are turning their backs on Brexit. 25% of 2016 Labour Leave voters have changed their mind. In a counter move forces hostile to socialist internationalism are also organising inside the Labour movement. Counterfire, which occupies leading positions in the Stop the War Coalitioon and the People’s Assembly, are hostile to the pro-EU motion. In the run-up to the Labour Party conference in the period 23-26 September, all of this is a major threat to Corbyn. If the right succeed and change the party’s existing antisemitism code, and water down the party’s commitment to a People’s Brexit, this will sap away at the energies and hopes of left activists and voters, and breed wider discontent and distrust with the political system. The consequences would be disastrous. The victory of the right in Labour would only do the Conservatives a favour by pushing Brexit voters in their direction, and it would embolden the real antisemites and the far right, the likes of Tommy Robinson, who feed on disillusion with the system. Faced with the invisibility of a ‘People’s Brexit’ it is perhaps a sign of desperation to try to link the issue of the EU to the Labour dispute about anti-semitism and to claim that to ‘defend’ Corbyn is to be against the call for a new People’s Vote. There is no such confusion for the majority of the left. UKIP and its former Leader Farage, are racist cheerleaders of the Carnival of Reaction, including the pro-Brexit Tommy Robinson crew, that has followed Brexit. Farage’s ‘Battle Bus’ and ‘Battle for Britain’ will no doubt receive the response they deserve. European Far-Right Sovereigntists to be led by US Steve Bannon’s The Movement. Raheem Kassam, Bannon’s Man in the UK. LONDON—Steve Bannon plans to go toe-to-toe with George Soros and spark a right-wing revolution in Europe. Trump’s former White House chief advisor told The Daily Beast that he is setting up a foundation in Europe called The Movement which he hopes will lead a right-wing populist revolt across the continent starting with the European Parliament elections next spring. The non-profit will be a central source of polling, advice on messaging, data targeting, and think-tank research for a ragtag band of right-wingers who are surging all over Europe, in many cases without professional political structures or significant budgets. Bannon’s ambition is for his organization ultimately to rival the impact of Soros’s Open Society, which has given away $32 billion to largely liberal causes since it was established in 1984. Over the past year, Bannon has held talks with right-wing groups across the continent from Nigel Farage and members of Marine Le Pen’s Front National (recently renamed Rassemblement National) in the West, to Hungary’s Viktor Orban and the Polish populists in the East. He envisions a right-wing “supergroup” within the European Parliament that could attract as many as a third of the lawmakers after next May’s Europe-wide elections. A united populist bloc of that size would have the ability to seriously disrupt parliamentary proceedings, potentially granting Bannon huge power within the populist movement. After being forced out of the White House following internal wranglings that would later surface in the book Fire and Fury, Bannon is now reveling in the opportunity to plot his new European empire. “I’d rather reign in hell, than serve in heaven,” he said, paraphrasing John Milton’s Satan in Paradise Lost. The Movement’s headquarters are expected to be located in Brussels, Belgium, where they will start hiring staff in coming months. It is expected that there will be fewer than 10 full-time staff ahead of the 2019 elections, with a polling expert, a communications person, an office manager and a researcher among the positions. The plan is to ramp that up to more like 25 people post-2019 if the project has been a success. Bannon plans to spend 50 percent of his time in Europe—mostly in the field rather than the Brussels office—once the midterm elections in the U.S. are over in November. The operation is also supposed to serve as a link between Europe’s right-wing movements and the pro-Trump Freedom Caucus in the U.S. This week Paul Gosar (R-AZ) was its envoy to Bannon’s operation in London. Bannon and Raheem Kassam, a former Farage staffer and Breitbart editor, set up shop in a five-star Mayfair hotel for a week while Donald Trump was visiting Europe. Between TV appearances as Trump surrogates, they hosted a raft of Europe’s leading right-wingers at the hotel. Theresa May is facing an unprecedented political crisis, according to a new poll that reveals voters are implacably opposed to her Brexit plan and are prepared to turn to Ukip or parties of the far right. In a survey that will spark unease in Downing Street, the YouGov poll found that the public believes Boris Johnson, the former foreign secretary, is better placed to negotiate with Brussels and lead the Conservatives into the next election. It highlights how voters are polarising, with growing numbers alienated from the two main parties. About 38% would vote for a new party on the right that was committed to Brexit, while 24% are prepared to support an explicitly far-right anti-immigrant, anti-Islam party. One in three voters are prepared to back a new anti-Brexit centrist party. Tory donors and allies of Nigel Farage, the former Ukip leader, are now plotting to raise £10m to set up a new hard-Brexit party — a move that could make it impossible for the Tories to win the next election. A close ally of Steve Bannon, Donald Trump’s former chief strategist, told The Sunday Times he aimed to raise £1m from British and US sources to create a right-wing “mass movement” to rival Momentum on the left. It can also be revealed that Sir Vince Cable, the Liberal Democrat leader, was holding talks on the creation of a new centrist party when he failed to turn up for a crunch vote last week. The poll will prompt Tory MPs to demand changes to May’s Brexit proposal thrashed out at Chequers earlier this month. Just one in nine voters (11%) would support her plan in a new referendum and only 12% think it would be good for Britain, while 43% disagree. By more than two to one, voters do not believe her plan keeps faith with the referendum result. With the Tories on 38%, a point behind Labour, a Conservative party led by Johnson would be neck and neck with Labour, while his main leadership rivals — Sajid Javid, Michael Gove and Jeremy Hunt — would all be trailing Jeremy Corbyn’s party by between 10 and 12 percentage points. Johnson’s support is likely to grow if he is seen by MPs as someone who could prevent votes leaching to populist parties. Bannon said yesterday he was setting up a foundation called the Movement, to lead a right-wing revolt at next spring’s European elections. He held meetings in a Mayfair hotel last week with senior figures on the European hard right and far right, including Farage and the vice-president of the French National Rally, formerly the National Front. Raheem Kassam, a former adviser to Farage and employee of Bannon’s, said the post-Chequers chaos was “massively an opening for the right”. Hardline Eurosceptics warned Tory whips last week that they would vote to bring down the government in a confidence vote if May watered down Brexit. The only good news for May in the poll is that, while voters as a whole would like to see her resign, Tory voters still think she should fight on by a margin of 58% to 32%. The prime minister has ruled out a new EU referendum on the grounds that it would be undemocratic to revisit the 2016 vote. The poll shows that if voters were offered a new vote they would overturn the referendum result, with remaining in the EU beating leaving with no deal by 54% to 46%. RT (Russia Today) is a willing megaphone for Bannon. Un Soros du populisme ? Steve Bannon, l’homme qui voulait mener la révolte de droite en Europe. RT in Spanish repeats the same message but manages to call his movement’s allies the “far right”. Bannon will Einfluss auf Europawahl nehmen.